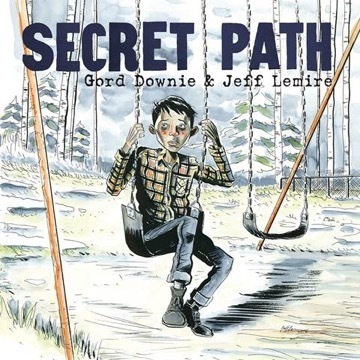 The stories Downie’s poems tell were fleshed into the ten songs of Secret Path with producers Kevin Drew and Dave Hamelin. Recording took place over two sessions at The Bathouse Recording Studios in Bath, Ontario, November and December 2013. The music features Downie on vocals and guitars, with Drew and Hamelin playing all other instruments. Guest musicians include Charles Spearin (bass), Ohad Benchetrit (lap steel/guitar), Kevin Hearn (piano), and Dave “Billy Ray” Koster (drums). The ten song album will be released by Arts & Crafts accompanied by Lemire’s eighty-eight page graphic novel published by Simon & Schuster Canada. Secret Path will arrive on October 18, 2016, in a deluxe vinyl and book edition, and as a book with album download. long commercial-free television special on Sunday, October 23, 2016, at 9pm (9:30 NT). 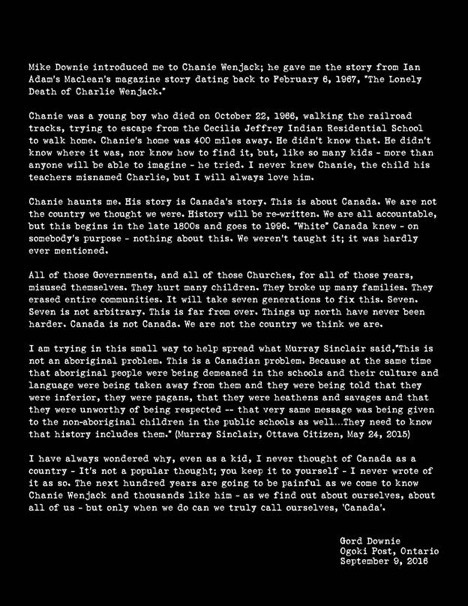 The broadcast date marks the fiftieth anniversary of the morning Chanie’s body was found frozen beside the railroad tracks only twelve miles into his journey.